''Another World'' was good enough for the Musea management to pick up The Vow celebrate the signing with the reissue of the album in 2001.The duo of Ralf Link and Holger Goetz begun working on a sophomore work, which was eventually released in 2002 with the title ''Trojan''.The comics-like artwork was again made of Vito Lamanna, while the album was a concept work around a hero of a videogame, skipping through different levels full of dangers. 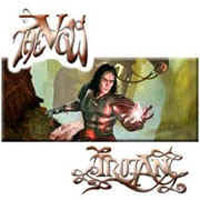 Musically the style of The Vow hasn't changed a bit, insisting on a very British-styled Neo Prog akin to CYAN, PENDRAGON or SHADOWLAND with balanced vocal and instrumental parts.However the songwriting seems more convincing and the melodies became more memorable, while the music remains deeply emotional and atmospheric.Quite long tracks with slight symphonic vibes and lots of interesting guitar work, both in up- and downtempo offerings.The sound of synthesizers is pretty sharp and bombastic, the vocals are very good, especially considering there is a German behind the microphone, and the arrangements are pretty solid with a decent cohesion.Some long keyboard preludes and a few minimalistic moments with little goin' on are the most evident flaws of the album.The listener will be nevertheless rewarded by a slightly theatrical atmosphere, some great keyboard textures and the guitar work of Link, which ranges from decent to outstanding.Do not expect though any kind of originality.The whole album is very British-sounding with no signs escaping from the fundamentals established by acts such as MARILLION, IQ or TWELFTH NIGHT.Fortunately the music is too good to be surpassed. Dedicated to all fans of British Neo Prog of the 80's.Melodic, atmospheric music with plenty of grandiose explosions.Recommended.